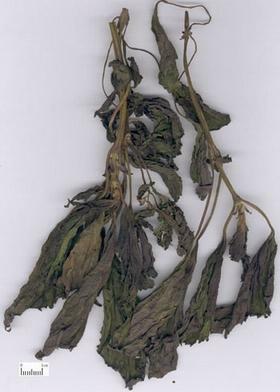 The foil (or the scion) of annual herbaceous plant Perilla frutescens ( L. ) Britt. of family labiatae. In summer when foils are thriving and inflorescence begins to sprout. Fragrant smell, slightly pungent taste. Large foil, purple color, no fragment, dense fragrance, no limb or peduncle, no impurity. Pungent, warm; lung, spleen and stomach meridians entered. Disperse wind-cold, promote qi flow and soothe the middle. This herb has mild actions of expelling wind and dispersing cold, inducing sweating to release the exterior. It can be used singly for slight syndrome, but for serious diseases, it should be used with other herbs that can disperse wind-cold. Because it can release exterior cold, promote qi flow and ease middle energizer, and also resolve phlegm and stop cough. Therefore, this herb is suitable for wind-cold exterior syndrome with qi stagnation, marked by fullness and distending sensation of chest, vomit and nausea, or cough with much phlegm. It is always combined with the herbs which regulate qi to soothe the middle or those resolving phlegm to stop cough. For instance Xiang Su San is combined with Xiang Fu and Chen Pi for treating the former disease from the book Tai Ping Hui Min He Ji Ju Fang, Su Xing San is combined with Xing Ren, Jie Geng to treat the latter disease from the book Wen Bing Tiao Bian. 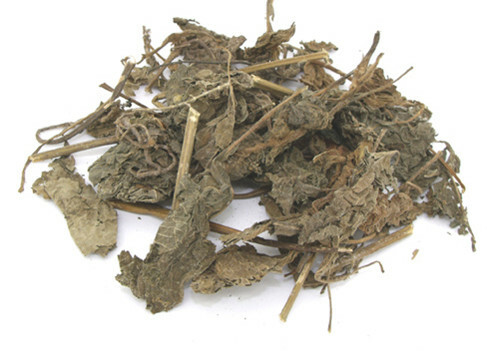 This herb can promote qi flow to soothe the middle energizer and ease distension, harmonize stomach and stop vomiting, and it also has some effect on regulating qi to prevent abortion. With these actions, it can be used for qi stagnation of middle energizer, marked by fullness and distending sensation in the chest and epigastium, nausea and vomit. For the patient with dominate cold, it is always combined with Sha Ren and Lu Gen for clearing stomach and stopping vomiting; while the patient predominate with heat, always adding Huang Lian, Lu Gen. If fetus-qi flows upward, with distending sensation in the chest and vomit, excessive fetal movement, it is always used with Sha Ren and Chen Pi whose action is to regulate qi and prevent abortion. For plum-stone syndrome (globus hysteriocus) due to stagnation of seven emotions, congealing of phlegm and stagnation of qi, the herbs for eliminating phlegm and promoting qi flow are often added. For example, it is used with Ban Xia and Hou Po in Ban Xia Hou Po Tang of Jin Kui Yao Lue. Decoct 5~10g. Do not decoct it for a long time.